6-channel VariaDot™ imaging technology for superb print quality and application versatility. Varnish and White ink support available for decorative and creative applications. Light Magenta and Light Cyan support option for superb near-photo print quality. True flatbed architecture with additional Roll Media Option. Excellent productivity with output speeds of up to 33.6m² per hour. Easy and reliable media positioning thanks to pneumatic registration pins. Automated Printhead Maintenance Option for consistent performance print after print. Improved productivity through new intelligent operator panel functions. Active Pixel Placement Compensation delivers accurate results across the whole table. 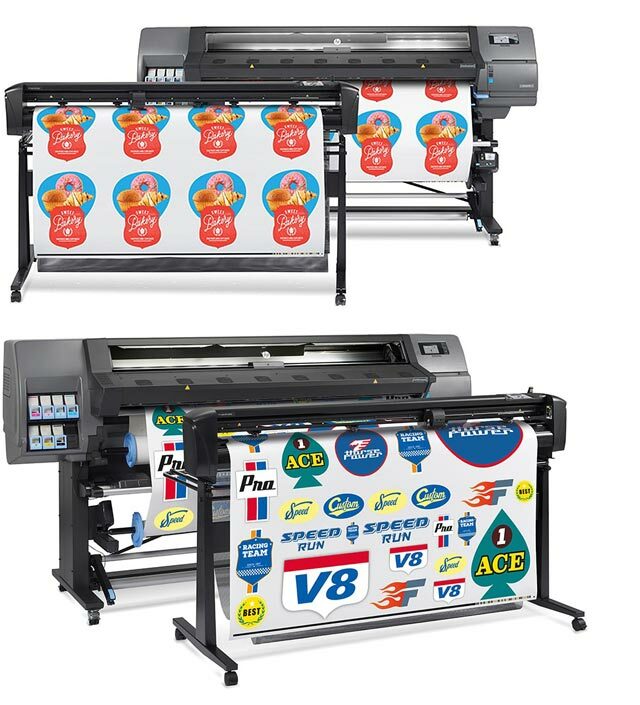 Upgradable to the Arizona 1280 GT for greater application versatility or superb near-photo print quality. Piezoelectric inkjet system with variable droplet printheads. Variable droplet sizes from 6 to 42 picolitres. The ability to vary the drop size to 6 picolitres produces sharp images with smoother gradients and quartertones. The ability to jet larger droplets up to 42 picolitres produces uniform colours. The result is near-photographic quality with sharpness only before seen at resolutions of 1,440 dpi or higher. Text as small as 2 pt. is perfectly legible (with High Definition mode). 125 cm x 250 cm. 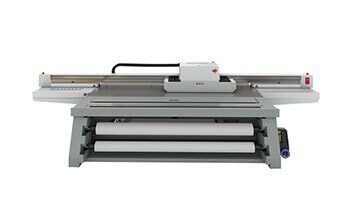 Up to: 126 cm x 251 cm (for edge-to-edge printing). 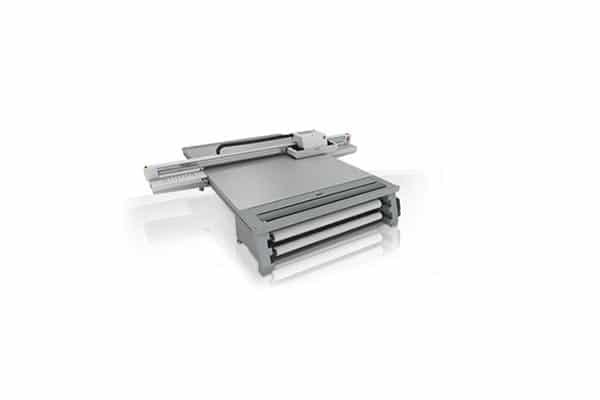 90 to 220 cm, Up to 50 kg (at any width), Maximum diameter: 240 mm, Core: 3 inches (inside), Bias: Print-side-in or print-side-out, Most types (application dependent). 60 cm x 80 cm (min) to 125 x 250 cm (max). ±0,8 mm max error, measured over 2,5 m.
±0,4 mm max error, measured over 1,25 m.
0,5 mm max error, measured over 1,25 m.
1,0 mm max error, measured over 2,5 m x 1,25 m.
±0,6 mm max error, measured over 2,19 m.
±1,5 mm max error, measured over 2,0 m.
0,7 mm max error, measured over 2,19 m.
2,0 mm max error, measured over 2,0 m.
2,5 mm max error, measured over 2,0 m x 2,19 m.
ONYX® Thrive™ (421 configuration or greater recommended). ONYX® ProductionHouse™ (available, not recommended). 2 X 200-240 VAC, 50/60 Hz, Single-phase, Rated Current: 16A, Circuit Breakers Europe: 16A. Clean, dry, compressed air using a Coalescing Filter, Pressure Regulator set to 690 kPa (100 psi) and 6 mm outside diameter air tubing. Peak flow: 56 l/min at 690 kPa. Relative humidity: 30 to 70% (non-condensing). Ventilation: 1,200 m3 per hour minimum (see Site Preparation Guide). 2,750 m maximum, however some components specify a limit of 2,000 m.
Printer only: 4.66 m x 2.0 m, 785 kg. 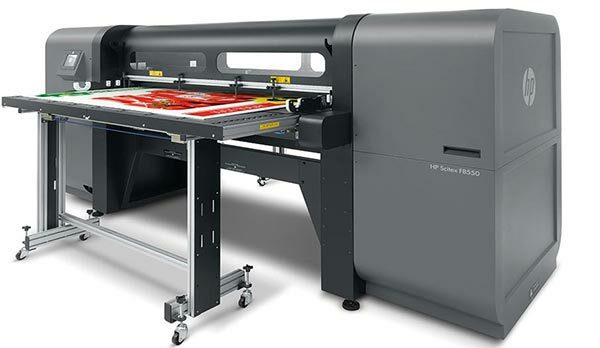 Printer + Roll Media Option: 4.66 m x 2.3 m, 960 kg. 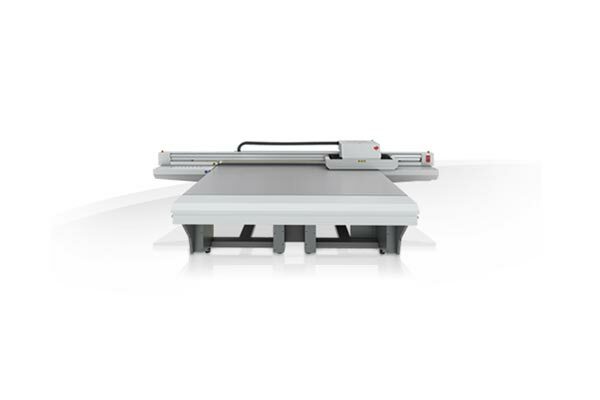 Table height: 0.88 m / Overall height: 1.3 m.
Add 2 ink channels to the printer at any time. Add a Roll Media Option to the printer at any time. Add a Static Supression Kit to the printer at any time. Add an Automatic Printhead Maintenance System to the printer at any time. 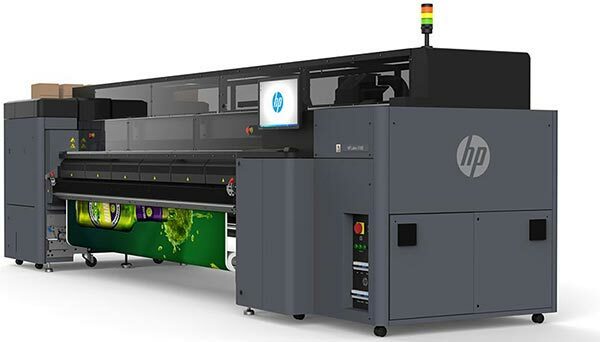 Application of the 2-Channel Upgrade converts an Oce Arizona 1260 GT to Oce Arizona 1280 GT adding Light Cyan and Light Magenta for near photo quality and fine-art printing or adding White ink and/or Varnish capacity for backlit and non-white media applications. All specification are subject to change without prior notice. 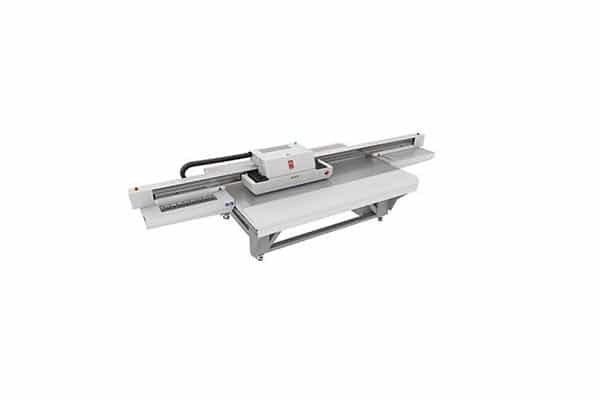 – 6-channel VariaDot™ imaging technology for superb print quality and application versatility. – Varnish and White ink support available for decorative and creative applications. – Light Magenta and Light Cyan support option for superb near-photo print quality. – True flatbed architecture with additional Roll Media Option. 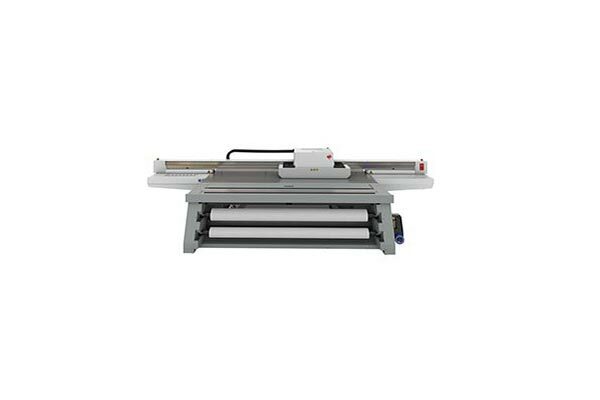 – Excellent productivity with output speeds of up to 33.6m² per hour. – Easy and reliable media positioning thanks to pneumatic registration pins. – Automated Printhead Maintenance Option for consistent performance print after print. – Improved productivity through new intelligent operator panel functions. 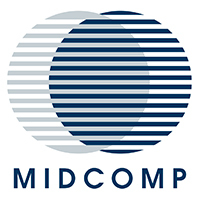 – Active Pixel Placement Compensation delivers accurate results across the whole table. – Upgradable to the Arizona 1280 GT for greater application versatility or superb near-photo print quality. For a quote on the Océ Arizona 1260 GT please send us your contact details and we will get in touch with you soon.